Members of Orthodox Jewish Chamber of Commerce meet with GOP mayoral candidate challenging NYC Mayor Bill de Blasio. 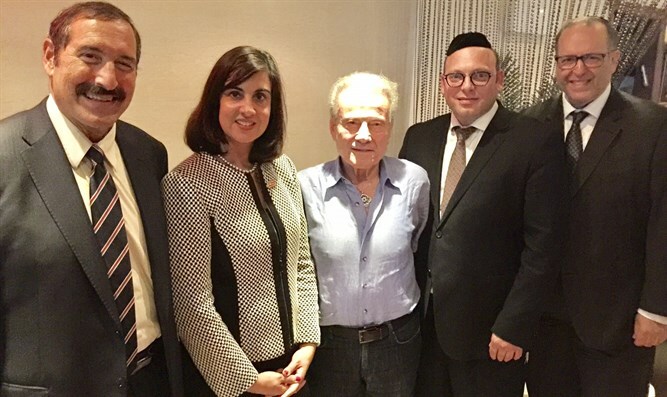 Assemblywoman Nicole Malliotakis, the Republican challenger to New York City Mayor Bill de Blasio, and key campaign officials, were in La Brochette kosher steakhouse in Manhattan on Monday evening to meet with a host of prominent leaders of the Orthodox Jewish and Asian-American communities. The election, which is less than two months away, is heating up, as Ms. Malliotakis now qualifies for matching campaign funds and the mayoral debates are just around the corner. Duvi Honig, Founder and CEO of the Orthodox Jewish Chamber of Commerce, and Dr. Joseph Frager, the Executive VP of the Chamber’s Public Policy Committee, were among the primary event hosts and held extensive conversations with the candidate regarding various issues of importance to the City’s economy and the Jewish community in particular. The Assemblywoman was particularly impressed by the recently opened Cornell University Tech School on Roosevelt Island, a prestigious program run in coordination with the Technion-Israel Institute of Technology. Israel has so much to offer the U.S. in the areas of technology, security and more, and the U.S. would be wise to take advantage of that as much as possible. The Orthodox Jewish Chamber of Commerce activists stressed the enormous potential for U.S.-Israel economic ties to boost the economy in New York City and beyond. The Chamber has been a leader in strengthening ties between the two nations, as well as in the battle against the BDS movement and other anti-Israel forces. Dr. Frager observes that the City’s Orthodox community can have an outsized influence in this particular race. While Mayor de Blasio currently holds a comfortable lead in the polls, the electorate is only now beginning to tune in to the race and the respective candidates’ records. The November election is expected to see light general turnout; hence a strong turnout by the Orthodox voters can cause a significant swing.